I have often felt that “sorry doesn’t cut it” either — but for a different reason. We need another word besides “sorry” that conveys compassion but not culpability. Women especially. When something bad happens to somebody, I’ll automatically say, “Oh, I’m so sorry.” I am not apologizing but expressing regret, but often the reply is, “It’s not your fault.” Of course it’s not my fault but I can still feel compassion for them. Women are told we say “sorry” too much, and that it diminishes our authority and credibility. Grey Advertising created a compelling ad for Pantene around this very issue. As the video below (from Good Morning America) shows, this powerful message was applied to those situations where an apology was definitely not needed – and also offered examples of how women could re-frame their words without using “sorry”. It’s impressive and a great message. That still leaves us with all of those interactions where we are not apologizing but expressing regret and compassion. We don’t really have a word that differentiates an apology implying wrongdoing on our part (whether or not it is warranted) from one that simply expresses empathy. So, I offer this challenge to you as a way to stop saying you are sorry when it is not called for. 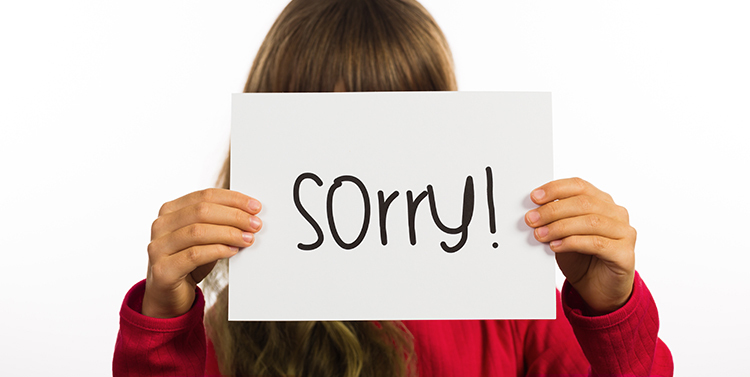 For at least one full day, mentally substitute the popular slang equivalent “My bad” for “I’m sorry”. How often did it really fit the situation? My guess is that most of the instances where “I’m sorry” was appropriate were for expressions of compassion, rather than an automatic apology for an imagined misdeed. Even though we don’t have a word for it, “I’m sorry this happened to you” or some similar compassionate response may be the only “sorry” you are left with at the end of the day. In that case, sorry does cut it.